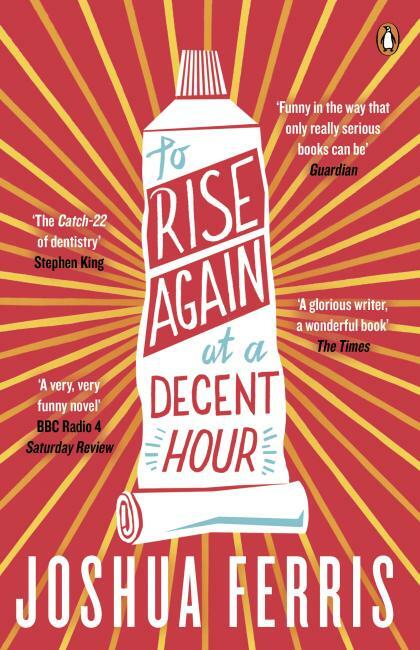 To Rise Again at a Decent Hour (Hatchett 2014), the third novel from Joshua Ferris and among the first two American novels shortlisted for the Man Booker Prize, focuses its attentions on narrator Dr. Paul O’Rourke, DDS, a lonely wiseacre Manhattanite who spends his hours haranguing his dental staff, especially his devout head hygienist Mrs. Convoy, about any number of well-worn hobbyhorses: the absence of God, the Boston Red Sox, the perpetual solipsism of our me-machine-obsessed culture (“me-machine” here being O’Rourke code for “cellular device”). If this sounds dour, don’t worry: Like most curdled romantics, O’Rourke’s outrage comes edged with a whole lot of acerb and wit (this is first and foremost a comic novel—like, a Big Laugh Ha-Ha comic novel) and even O’Rourke’s glum philosophizing about dentistry—“A dentist is only half the doctor he claims to be. That he’s also half mortician is the secret he keeps to himself”—bristles with a cynic’s humor. Later portions of the novel devoted to nearly unbelievable developments in the plot—including the discovery of someone impersonating O’Rourke online and an obscure, possibly inextant religious sect with designs on O’Rourke—don’t always compel as much as the novel’s early pages, but on the whole this is a funny, incisive novel that has much to say about life in the twenty-first century. Joshua Ferris, To Rise Again at a Decent Hour. Published by Hatchett, 2014. 352 pages.